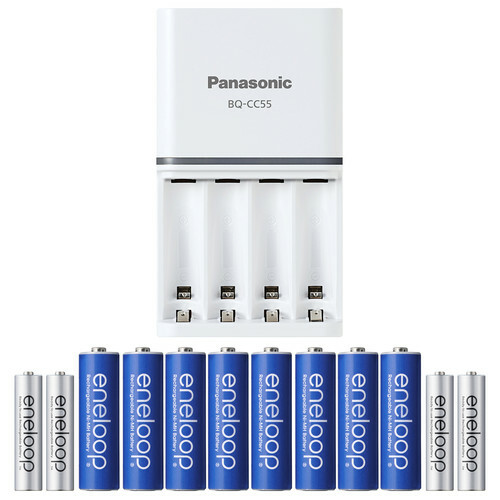 The Eneloop CC55 Quick Charger Kit from Panasonic contains eight Ni-MH AA batteries with a capacity of 2000mAh and four AAA batteries with a capacity of 800mAh. The batteries have been pre-charged by solar power, so they are ready to use out of the package. The included CC55 charger has four charging bays with individual LED charge indicator lights, which shows how much each battery has charged. To charge a fully depleted battery, it can take between three and four hours, and once all the batteries are fully charged, the charger will automatically shut off for overcharge protection. Within the charger, the batteries can be placed in any combination by mixing the AA or AAA's, and the configuration won't affect the charging times. Because of their slow self-discharge, even after 10 years in storage the batteries maintain 70% of their charge, and can be recharged up to 2100 cycles. In addition, the charger has an integrated, retractable, American AC plug, but can be used anywhere in the world because of its universal 100-240V capacity. Eneloop CC55 Quick Charger Kit is rated 4.7 out of 5 by 42. Rated 5 out of 5 by James from Better than expected Charges batteries fast. I like that the colors show 4 stages of charge in three VERY vivid, pleasant and not glaring colors – red <20%, yellow 20 to 80%, green >80% and then no lights when 100% charged. I charge a macro remote control that always eats batteries, a water tooth irrigation device that also eats batteries, multiple flashlights many of which have small parasitic electrical use, a 4 AA cell flash that so far have not seen it exhibit parasitic usage, etc. Had a high end AA, AAA charger but it did not show the condition when the battery first start charging. That feature lets me know if I should change the time interval between charges for the main battery hog, the tooth irrigator, or if I should go with new rechargeable batteries. Rated 5 out of 5 by Paul from Best by far! Have some I still use ten years later! I have some from back in the day when these were sold under the 'GE/Sanyo' brand name, an early generation and I've used them for some ten years, maybe more as I purchased them back when I had a store of my own. The current generation is rated for even more charges and longer shelf life! I can't image how they could be even better! I'm ordering this kit today as even at the regular price you'll save money over the years with these, lots of money! (Why am I ordering more? I lost a set otherwise I'd still be using them- ten years later!) I can't recommend these high enough! Rated 5 out of 5 by Fernando from This is an awesome Package! This KIT is just the best cost/benefit ever! Hope have more to buy into the future! Envelop is the best brand for rechargeable batteries out there, and the charger (model BQ-CC55) recharge 4 AA between 3~4hrs, so its fast if you compare with the 7 hour charger. Rated 5 out of 5 by Dave W. from Eneloops all the way. As I said in my other recent Eneloop purchase feedback, I'm done with AA and AAA Alkaline batteries and all of the leak issues :-(. I have some Eneloops in continuous, daily use for almost 7 years, recharging every 2 weeks, and they seem to be working as good as ever. This purchase is to add to my 20+ other Eneloops that I use for Speedlites etc. Rated 5 out of 5 by Jaime from I love this line of rechargeable batteries from Panasonic! Youre probably used to seeing those cheap, blue-labeled, basic-looking Panasonic batteries at the 99 cent store, but these arent those kinds. These rechargeable batteries exceeded my expectation. I decided to by the Eneloop CC55 quick charger kit. I previously bought the Eneloop Pro batteries and was happy with how they worked. Summary: - These come with 8 AAs and 4 AAAs that come precharged. - If you dont use them, they dont really discharge like most rechargeables. - You can use the charger to charge both AAA & AA. - There are 4 individual charge indicator lights instead of the usualy, annoying 2 lights for four slots. - These will charge your batteries from empty in about 3-4 hours. - It has an integrated, retractable AC plug that makes it nice and portable. - It will automatically shutoff to protect your batteries from overcharging. - The AAs are 2000mAh and the AAAs are 800mAh, both NiMH, rated at 1.2V. - They will hold roughly 70% of their charge over 10 years and you can recharge them up to 2100 cycles. The Eneloops are definitely my go-to rechargeable batteries. I used them for the external flashes for my Sony mirrorless cameras, as well as for their transmitters most of the time. Rated 4 out of 5 by Chao from Good cells at a fair price There's not much difference between major-brand Ni-MH cells in standard AA & AAA sizes, and these Eneloop cells usually cost a premium. They may be worth the extra money if you're concerned about self-discharge rates (perhaps for an emergency flashlight that might be stored unused for several years). But when this kit is on sale & costs no more than other brands, you might as well stock up & save! Rated 5 out of 5 by R H from Great Batteries I use these rechargeable batteries for just about everything that requires a battery. In particular items that sometimes may sit for a while, so that I don't have to worry about a depleted charge battery leaking into the item and ruining it. Rated 5 out of 5 by Mark from Eneloops are the Best! 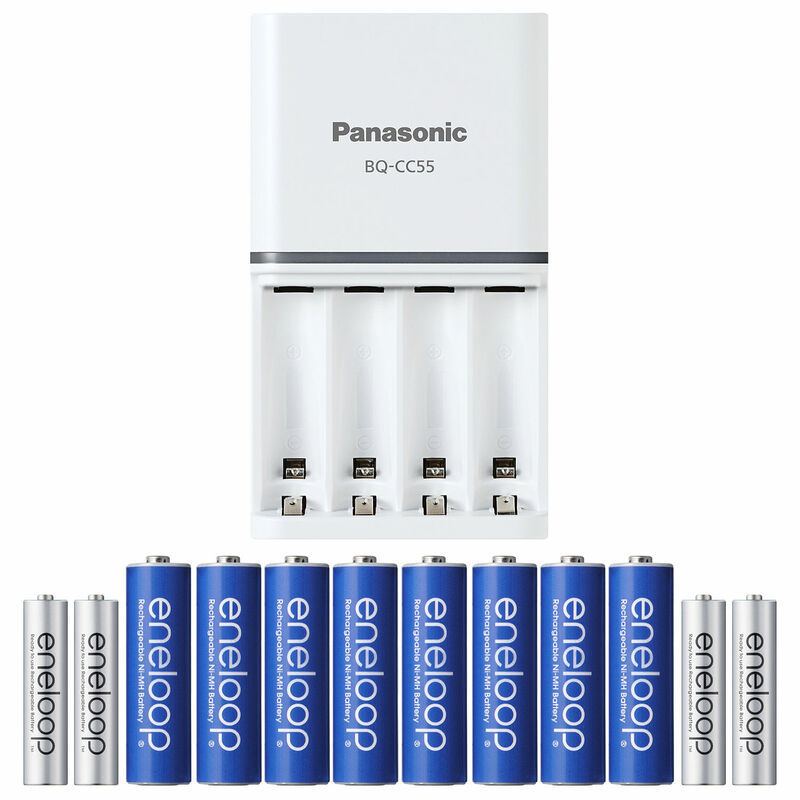 Panasonic Eneloop batteries are expensive, but they really are the best rechargeable AA batteries I've ever used. This set with 8 AAs, 4 AAAs and a smart charger is a great deal. Get it while you can! What is voltage output of this elements? This kit comes with eight AA batteries with a capacity of 2000mAh and four AAA batteries with a capacity of 800mAh. Does the charger can charge the eneloop 2550mAh AA batteries (the black ones)? Yes, it will charge the 2550 mAh AA Eneloop batteries.In fact, the CC55 Quick Charger can be used for any AA or AAA rechargeable battery (2 or 4 at a time) and not only the Panasonic Eneloop brand. Does the faster charging reduce battery life? I have used these for 12 years or so and have never had a problem- and they still work fine. Haven't had an issue with the newer ones I bought from B&amp;H but have only had they under a year. I need at least 8 18650 3.7 V batteries that are not flat topped and a charger. Do you have a package that will meet my needs? Is there a difference between this charger and the BQ CC17? I have that one and while it works great for the AA batteries, the AAA batteries will not snap in. No matter what I do, they fall out. My charger looks exactly like this one. With the right plug adapter, can I use this in the UK? Without using a voltage converter? Thanks! No voltage converter is necessary, only a plug adapter. Unit CC55 is rated for input from 100 to 240 VAC, 50 / 60 Hz at 0.3 A. Regular AA batteries if left in a TV remote gets moldy after say a year sometimes. Would these have the same problem? I've used Eneloop batteries for literally over ten years- probably the same ones for over 12 years as I used to own a photolab that I sold these in and closed the business ten years ago. They are amazing! Not only do they not leak, they continue to be able to be charged and used again! And it sounds like Panasonic has 'raised the bar' on this batteries even higher. They used to be marketed under 'GE/Sanyo', that's how old mine are! Worth every penny- I bought more last time they had them on a special just because I figure at over ten years, at some point, they will quit! Second, I would imagine the issue you're mentioning isn't mold, but chemicals leaking and ruining whatever those batteries were in. I've had some of the so-called best brands do that but NEVER these!